The recently FCC approved Samsung A867, with a sketch reminding of the OMNIA, is actually a phone, reminding of the OMNIA. 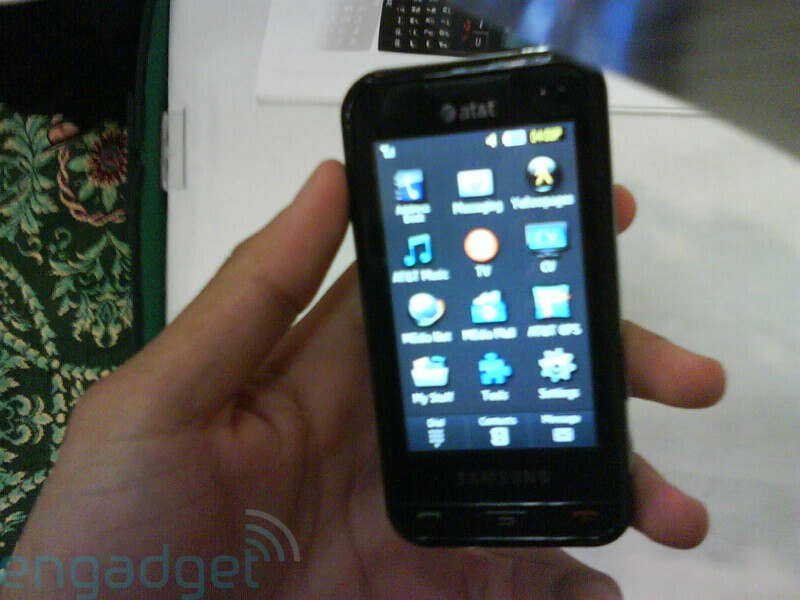 EngadgetMobile got the first spy photos of the handset, which is expected to be branded as the Eternity. It is a non-smart device, based on similar software to the Pixon, with wide 3.2” touch display (240x400 we guess), 3MP camera, 3.5mm jack, microSDHC card slot, aGPS and MediaFLO mobile TV, in order to compete with the Vu. It is said to launch next month at a price below $150 with a contract. We hope it will have support of DivX and XviD, just as the Pixon. Eternity for men....by Calkin Klein Looks like a cool phone, but they are seriously running out of names. 5MP camera on the T-Mobile T919. Guess we'll have to wait and see on that. I thought the same thing about the Glyde and we see how that turned out. I was still hopefull that At&t would bring OMNIA but now I see that they are really scared to bring 5 mp touch phone that they think could take away sales from idiotic iPhone. Now I have to get OMNIA without 3G. No one with the brains in the company. I agree. I will go back to T-Mobile if At&t do not want to listen to cutomers. You know, not everyone likes winmo. Alot of people despise it, in fact, and unless you're a complete technophile or a savvy businessman with alot to manage on the go, it's really not an "ideal" OS for many cell phone users. Get a Fuze if you need touch, winmo, and a heavy duty camera all in one. But I don't really see what you mean about at&t being afraid of sales...Phones with all those features are expensive, not everyone is going to jump at dropping 300+ on a phone. On the flip side, touch screens are obviously on the rise this year, and the eternity is just another way for at&t to cash in on that. Gobs of people are buying iPhones, but sooner or later, people are going to realize that they can't afford the almost 2500 dollars it costs just to be able to use an iPhone for 2 years and it's going to drop off. In the meantime, there's no reason simpler touch screen phones like the Vu and Eternity shouldn't fill the void of price-conscious consumers who still like new technology. This is gonna be a solid phone. Samsung has a good reputation with touch screens (instinct, anyone? ), it's still bringing us TouchFlo, divx and xvid, and 3.2" screen, and a 3mp camera, and all the other tech stuff alot of people eat up (gps, memory card slot, etc) There's just not room in at&t's lineup for the Omnia. That's what the fuze is for, really. The eternity is meant to come in and replace the lackluster Vu for a consumer-friendly touchscreen, and it's going to do just that and sell a hell of a lot of units during the holidays. Why does everyone feel the need to hate on at&t? They've come out with 4x as many phones as any other carrier in the last 6 months. They have everything under the sun...and now they want to bring us a fun touchscreen for the holidays at a GREAT price and noone can feel the love? if this is the final product then the interface is more "boring" compared to the pixon and behold. and i saw the pics of this engadget has and it looks like it doesnt have flash. thats good news for us T-MobileERS. aha!